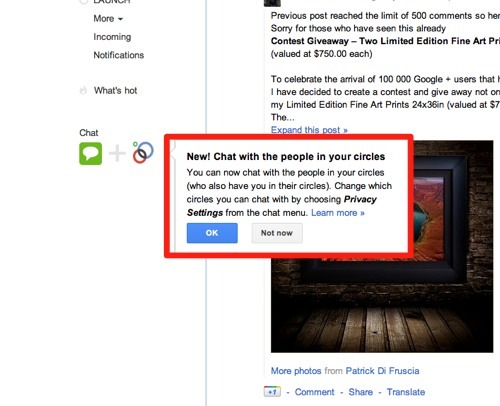 Google+ just added a new mutual circle chat feature to let you interact with people in your circles who have also added you to their circles. The Google+ mutual circles chat is similar to Twitter's direct messaging service, which lets you privately message anyone who is a mutual follower. It is also quite similar to Facebook Chat, which lets mutual friends engage in a group chat. Earlier this month, Google copied Facebook badges essentially pixel for pixel with its launch of Google+ badges for websites. Granted, Facebook has copied a good chunk of what Google+ has done. Instead of seeing all of your contacts in your Google+ chat list, you'll only see people from your most recent conversations who are currently online. Even when you're not using Google+, you can still chat with them via other Google products, such as Gmail, iGoogle, Orkut and the Google Talk client. Google+ initially launched with Hangouts to let you video chat with people in your circles. Now, about five months later, users can chat with people in their circles via text. Before, you could only chat with people via Google+ if you knew their email address.